Launch: Bull Hall Recreation Area, a National Forest Service administered site. Excellent ramp, good at any tide. Nearby campsites:Right there at Bull Hall campground. 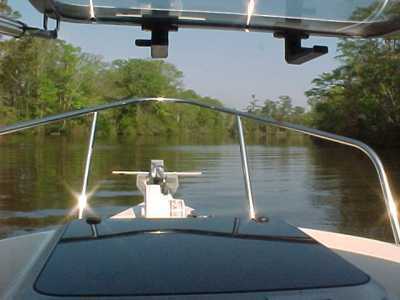 Comments: This access puts you right into the middle of some of the best cruising on the South Carolina coast. 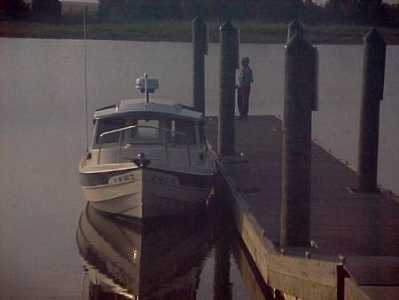 -----We decided to trailer northerly into South Carolina and were looking for a place to spend the night while we searched out a ramp into the Intra Coastal Waterway. We scoured the Atlas looking for a park. I spotted one, Hampton Plantation State Park. 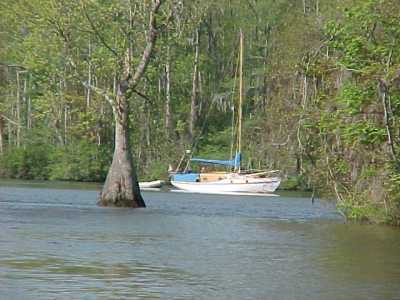 "It's not far from the water and it will be nice to 'camp' ashore for a night," I suggested. -----"I don't see the green tent - the one they use for marking campgrounds in this Atlas," El said squinting at the dusty well-traveled map. -----"Hard to see those things," I said confidently, "and it's a State Park, so they have to have camping." -----A half hour later, El spotted the official brown sign, and we turned off onto a narrow dirt road. "I don't know, hon. This looks a little marginal for a big state park," she said, as the sandy road meandered farther into the moss-draped forest. -----We drove on about a half-mile or so and it really looked dodgy. Ahead it looked like the road ended in a small parking lot. "I don't think so," El mumbled warily. -----A driveway appeared on the right that headed to the manager's house. I wheeled the truck and trailer into it, with the hope that I could back out onto the road behind and turn around. -----As all who have trailered understand, this is not a simple maneuver in tight quarters. When I was half way through the operation, the manager appeared from his house. He didn't look happy at the creases I was putting in his sandy driveway. -----He looked at our Nevada license plate, shook his head, and slowly drawled, "You guys missed the ocean by 11 miles!" -----A half-hour later, we were settled at his suggested campsite at Bull Hall Recreation Area, just south of his state park. Oh, yes - Hampton Plantation State Park is an historic park that preserves a fine old southern mansion. -----We launched into the early morning mist, tied off at the floating pier, and had a cup of coffee before beginning our northerly cruise. Blackbirds called from the reeds, egrets stood like white statues along the muddy banks of the ICW - not a zephyr stirred the mirror-smooth water. 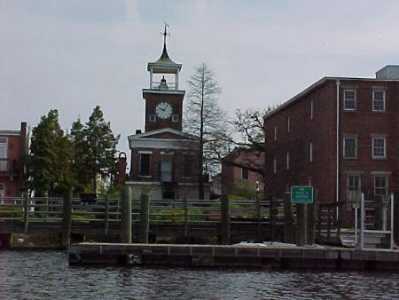 -----We cruised for days, anchoring in places like Great Pee Dee, Jericho, Cow House, Waccamaw River, and Ruinsville Creek. We pondered what stories lay behind those names. We provisioned in Georgetown, and what a charmer. Never had crab cakes as good as those at Thomas's. -----There is only so much time in life, so choices become essential. We have long discussions, El and I, about which places have the highest priority in our cruising itinerary. "The Carolina Sounds are incredible and extensive," El muses as she ponders the coastal charts. "There's enough cruising for many a season in those bays and rivers." -----"Let's give it a miss this year," I suggest. "Spring is already well advanced and perhaps we should have as much time as possible in the most distant places - like Canada." -----El quickly agreed. "Just what I was thinking. But let's stop and see our sailor friends on the way by, and maybe cruise a few days with them." -----We had written our friends, he a fellow geologist, a month or so before and in their return mail they told us the timing would be good. Now that we were in North Carolina, we gave them a call. "Neil died suddenly two days ago," our friend said. We were shocked. "You to the left, and I to the right, for the ways of men must sever. And it well may be for a day and a night, and it well may be forever." -----A snippet of a poem learned in college rings through my head. So true. So true. 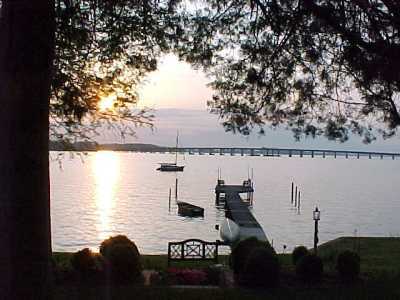 -----After visiting a few days ashore with our friend, we drove north to Maryland. We carried some of Neil's cruising guides with us so he could accompany our journey in our minds. After the death of another good friend, a river-running mentor, I carried his drinking cup every step of the way along the Appalachian Trail, from Georgia to Maine, in his memory. I drink a cup of green tea every day, after another travel mate died of intestinal cancer, and his last words to me were, "Drink green tea." I do, my friend, every day and I remember our good times together.